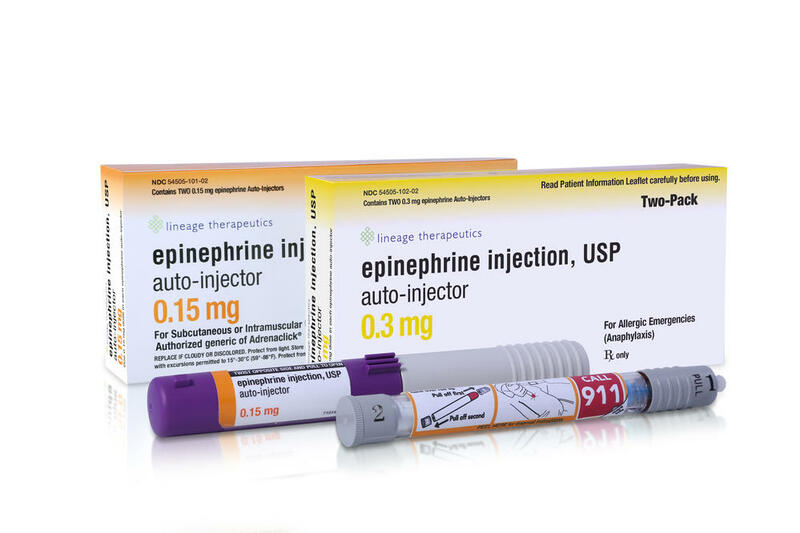 Epinephrine auto-injectors remain the mainstay treatment for anaphylaxis. 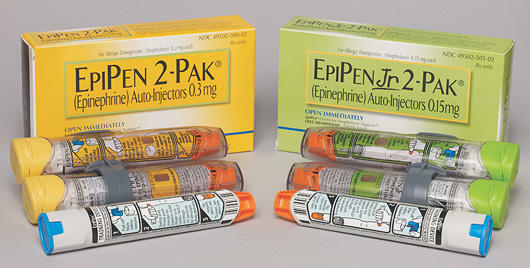 Several epinephrine auto-injectors are now available in the United States (including a generic version). Each contains the drug epinephrine, but each device has its own unique set of instructions for use. Understanding the differences is important to ensure that you get the device you want and you know how to properly use it. This chart summarizes the key facts and patient information pertaining to each of the currently available epinephrine auto-injectors. All listed auto-injectors are available in twin packs which contain two (2) pre-filled devices. Additional details, including patient instructional videos, are available at the manufacturers’ websites. Please be mindful of state and federal dispensing regulations that pharmacists must follow when filling your prescription for epinephrine. It is important to note that there are many states in which the pharmacist is allowed to substitute a generic form of the prescription when indicated on the prescription and after receiving a verbal approval from the physician. If you or your physician prefer to receive a specific brand name of epinephrine auto-injector, your physician must indicate the brand name and “DAW” (dispense as written) or “do not substitute” on the prescription. This indication prohibits the pharmacist from dispensing a generic form of the prescription. Regardless, before you leave the pharmacy, make sure the pharmacy fills your prescription exactly as you and your child's doctor expects. Remember to speak to your child’s physician to determine which epinephrine product is best for your child. Since each device operates differently, make sure that you have been adequately trained to use the device that you leave the pharmacy with and review the training video for that device. Product information for Adrenaclick™. Amedra Pharmaceuticals LLC. Horsham, PA 19044. June 2012. 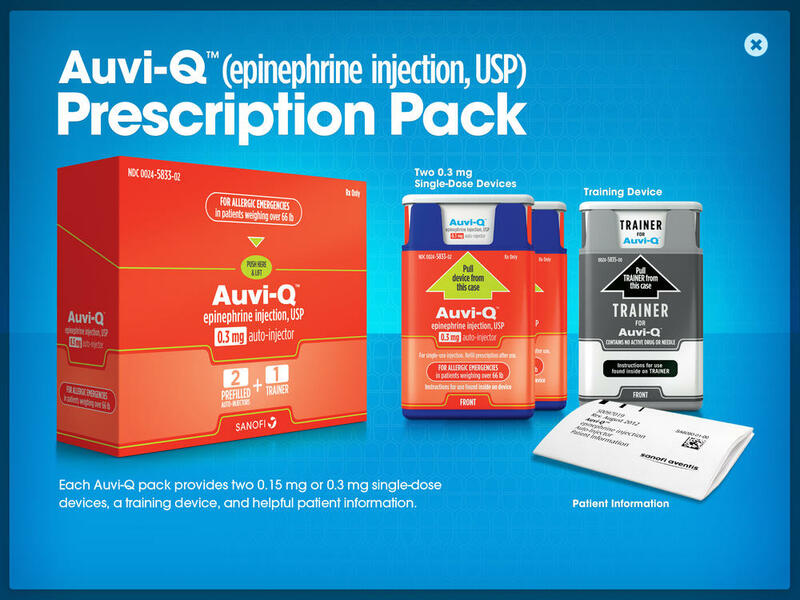 Product information for Auvi-Q™. Sanofi-Aventis U.S. Bridgewater, NJ 08807. September 2012. Product information for Epinephrine Injection, USP auto-injector, the authorized generic (AG) of Adrenaclick™. Lineage Therapeutics. Horsham, PA 19044. March 2013. 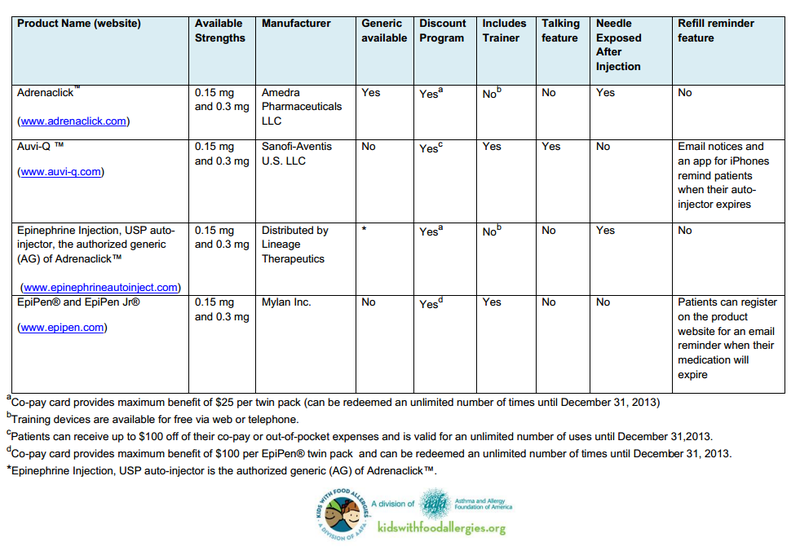 Product information for EpiPen. Mylan Inc. Basking Ridge, NJ 07920. August 2012. Angela Nace is Field Coordinator for Experiential Education, Department of Pharmacy Practice, at Jefferson University School of Pharmacy. She is also a member of the Kids With Food Allergies (KFA) Board of Directors and Liaison to the KFA Medical Advisory Team. Esther! Most insurances do cover Epipens. I would recommend calling your insurance and ask them if they cover Epipens. Sorry to hear that you are dealing with food allergies, but we are glad that you found us! You've come to the right place for support. The majority of insurances do cover epinephrine auto-injectors, but it really depends on your insurance policy as to which ones they will cover and how much they will cover. Has your doctor called in a prescription to your pharmacy already? Once your pharmacy has a prescription on file they should be able to submit a claim and tell you what your insurance will cover within minutes. Otherwise the pharmacy processor on your insurance card (common ones include Express Scripts, PCS, Caremark) can give you information on your pharmacy benefits. If the representative that you talk to says they don't know ask to speak to a supervisor---as your insurance's pharmacy processor it's their job to know whether a medicine is covered or not. Some pharmacy processors even have websites with benefit information and cost calculators for specific medicines, so that's an additional way you can find out more info on your coverage. Luckily, even if your insurance does not cover them there are currently manufacturer savings programs offered by the makers of Auvi-Q and Epi-Pen that cover up to $100 of the cost. 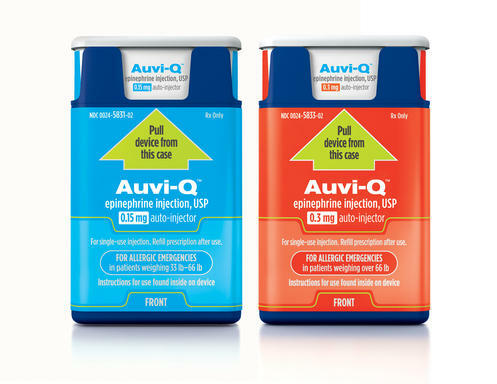 Visit http://www.auvi-q.com or http://www.epipen.com/ to check out more information about their programs. Hi Esther - I know that Auvi-Q and Epi Pen both have discounts at the moment to cover the cost of a prescription. You can see the link Lynda posted about regarding the Auvi-Q. And here is the info on EpiPen. Unfortunately, our insurance won't cover auvi-Q. It is interesting, however, since we pay 90% of our prescriptions. I did find out through an Auvi-Q rep that pharmacies set their own price. I had the pharmacist check on the pricing since we pay most of the price anyway, but it was about $39 more. It is sold to the pharmacies as the same price as the Epi-pens. My husband is self imployed - thus the expensive insurance. This is very interesting. Do you know if the generic for Adrenaclick will "overwrite" the brand one? We cannot seem to find its availability at least in FL. By overwrite, do you mean will brand Adrenaclick production be halted or are you wondering about generic substitution requirements between the two? As far as availability, many pharmacies won't order in a product or keep a product in stock unless they see a need for it (ie: until they have consistent requests for it). If you would like a specific item, most pharmacies are happy to order it in for you, and often they can have it in stock within a day or two of your request. My son's allergist gave us a voucher/coupon in case our insurance did not cover it - $25.00 for the first 2. Luckily, our insurance covered it, but it is still more expensive than Epi Pens. However, the smaller size (my son is just starting to carry) and the automated instructions are worth the extra expense for us. Ask your allergist if he/she has any coupons to spare! I got a prescription for Auvi-Q and tried to have it filled but my insurance refused it—they said I had to pay full price ($200+). So for now we are sticking with Epi-Pens. There will be 4 epinephrine auto injectors on the US market by the end of June - Adrenaclick, Auvi-Q, EpiPen and a generic of Adrenaclick.